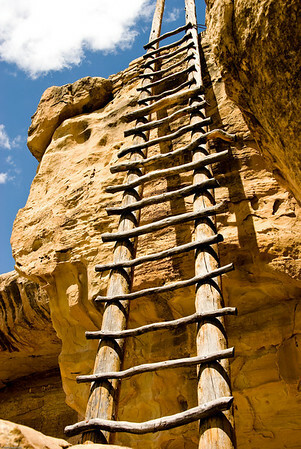 Last spring I traveled to New Mexico and Colorado and visited several amazing ancient cliff dwellings, where ladders abound. I have always loved ladders, and use them frequently in my own work. (In fact, there’s one in my header image above.) Ladders are such great metaphors. We use them to go up or down, but unless we’re frozen with fear or indecision (or we’re house painters), we rarely stand still on a ladder. Will we ascend or descend? Do we need to be rescued, like a cat in a tree? Will we kick away the ladder to shake a pursuer? Aspiration, spiritual growth, transcendence, ambition, achievement, failure, regression, safety, descent into the unconscious–all these concepts and more can be represented by ladders. 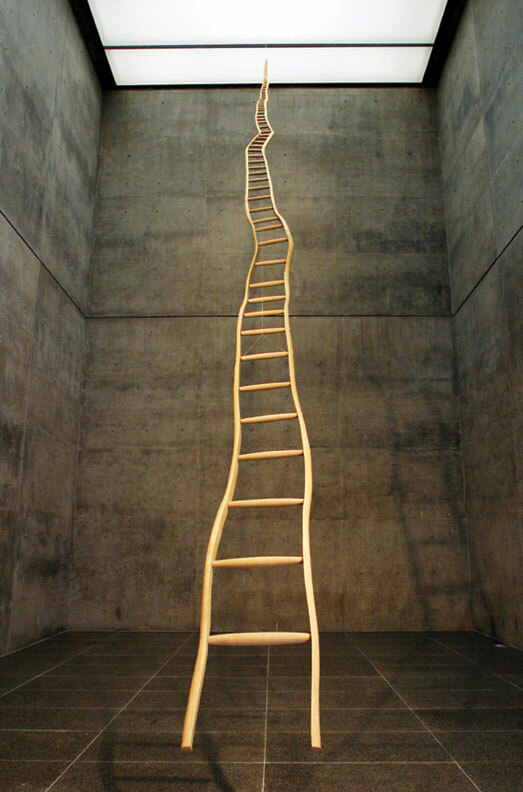 Martin Puryear has created works that relate to African American history, including Ladder for Booker T. Washington (1996). Various interpretations of the work have been put forth, including themes of aspiration, hierarchy, and the discouraging impossibility of reaching the top. Charles Brouwer’s Rise Up Atlanta (2011), a temporary sculpture in Freedom Park, Atlanta, was constructed of ladders loaned by individuals, organizations, and businesses. Each ladder, bearing a tag identifying its owner, represented the hopes and dreams of its lender, and joined together, the sculpture represented the aspirations of the community as a whole. Ladders figure prominently in Brouwer’s work. Here is his Lonesome Whippoorwill (2007), a train car with the words to the poignant Hank Williams song “I’m So Lonesome I Could Cry” carved around it. Artist Susan Bercu states, “The duality of the ladder as both practical workhorse and pathway to something higher was the provocation for my ladder structures.” The illustrated motifs and textured surfaces “represent the influences of nature and primitive cultures.” Shown are front and back views of her work Follow (2010). British sculptor David Nash fashions sculptures from timber. His many versions of Ladder reflect a spiritual theme. The diagonal Jacob’s Ladder pattern is a traditional one in quilting. 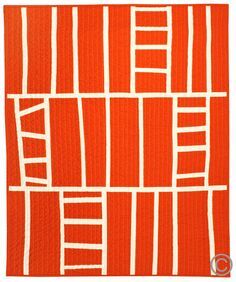 Here’s a modern variation on the ladder quilt by Barbara Perrino. According to the French artist François Méchain, his L’Arbre aux Echelles (in English, The Tree With Ladders) is “a poetic invitation to look at the world from another point of view, from further away, from higher up.” It looks very inviting to me. This entry was posted in ladders and tagged Barbara Perrino, Charles Brouwer, David Nash, François Méchain, Martin Puryear, Susan Bercu on February 6, 2015 by Helen Ellis.